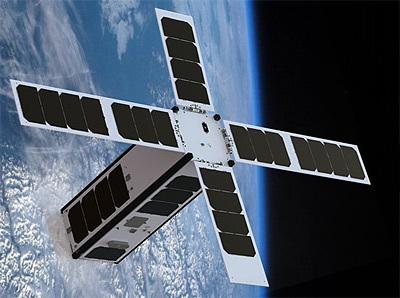 The Seahawk satellites, designed by the University of North Carolina, are 3U CubeSats to measure the ocean colour in project SOCON (Sustained Ocean Observation from Nanosatellites. They are prototypes for a larger constellation. The project is being led by John M Morrison, Professor of Physics and Physical Oceanography at the University of North Carolina, Wilmington, and also involves Cloudland Instruments of Santa Barbara, CA, NASA Goddard Space Flight Center, Greenbelt, MD, and Hawk Institute for Space Sciences, Pocomoke City, MD. The satellite will be built by UK based Clyde Space. The initiative is being funded by the Gordon and Betty Moore Foundation set up by Intel co-founder Gordon and his wife to encourage ideas that create an enduring impact in the areas of science, environmental observation and patient care. The aim is for these first two spacecraft will act as a precursor to a constellation of tens of SEAHAWKs, providing a global view of the health of our oceans and inland waters every day. Previous ocean monitoring to collect biological data from space used SeaWIFS (Sea-Viewing Wide Field-of-View Sensor). Its development took more than 10 years and cost $14.1 million. The SOCON project will develop and construct two SeaHawk CubeSats with HawkEye Ocean Colour Sensors in two years at a cost of $1.675m. The final product will be 130 times smaller (10 cm × 10 cm × 34 cm), 45 times lighter (approximately 4 kg), with a ground resolution 7-15 times better (150-75 meters per pixel), while still having a Signal/Noise Ratio approximately 50% that of SeaWiFs. The planned launch of the satellites is early 2017. The first satellite was launched on Spaceflight Industry's SSO-A multi-satellite launch on a Falcon-9 v1.2 (Block 5) rocket. SeaHawk 2 - 2019 with ?